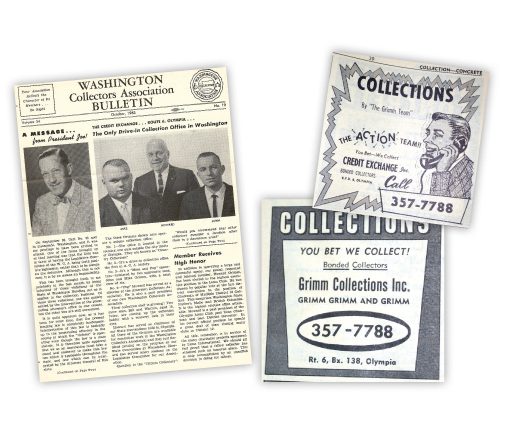 Founded in 1945, Grimm Collections has established itself as an industry leader that continues to revolutionize the field of account receivables management with a unique blend of advanced technology, proven techniques, and a highly trained staff of seasoned collection professionals. No agency can match our time-honored commitment to success and service for the thousands of professional and service industries we represent. 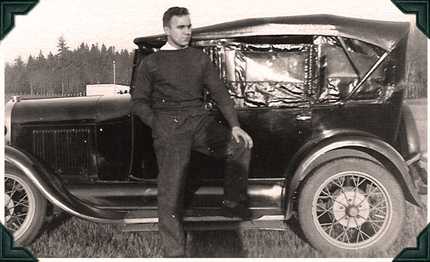 Founder Howard Grimm in 1938. When founder Howard W. Grimm first opened the company doors in Olympia, Washington, he set out to provide the most ethical and effective debt recovery service to address the unanswered needs of the busy credit executive. From the humble beginnings of a two-desk operation, the company is forged in the idea that by providing “best-in-class service”, our own success will inevitably follow. Through a lot of hard work and dedication, Howard succeeded, and his vision 60-plus years ago was the genesis of today’s world class company, still owned and operated by the Grimm family. For close to seven decades we have been recovering and managing commercial and consumer debt for a diverse collection of industries including retail, wholesale, healthcare, public utilities, service industries, government, municipalities, and banking/lending institutions. Today, our agency is characterized by its technological innovation, collection expertise, and knowledgeable personnel. However, client satisfaction and personal service are still basic to our core strength. We tailor our collection techniques to your specific needs in order to effectively communicate and leverage payments with your debtors. Grimm is the answer to keeping your revenue flowing. Please take a moment to discover all the differences that we will make to your bottom line!